For while we rejoice that our churches are increasingly diverse in ethnic and socio-economic character, our churches share a familiar approach to gospel ministry – because we are part of the same growing family. However diverse we are in culture, we share a family likeness, our familiar way of doing faithful and effective gospel ministry in London - our Gospel DNA. This is not necessarily any better than the way other churches do ministry. But it is our way. And it means that if you visit any Co-Mission church you will find a familiar atmosphere to the way we do church and gospel ministry. Our Gospel DNA is the distinctive gospel ministry culture that God has multiplied over the years which has proved both faithful to Scripture and effective in London. We need to identify it so we can preserve it. It is not a distinctive theological culture - we want to multiply churches with the same kind of biblical theology (summarised in our Statement of Faith available on the Co-Mission website) as other reformed evangelical churches, such as All Souls, Langham Place, Kings Church, Chessington, St. Helen’s, Bishopsgate and Enfield Free Evangelical. 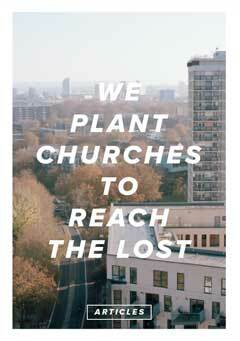 This is not a distinctive social culture - we want to plant a variety of churches for a variety of social cultures. And it is not a distinctive leadership personality type - we want to plant with a variety of leaders with varying kinds of personality appropriate to different church contexts. Our Co-Mission Gospel DNA is presented at some length in a new book: Gospel DNA. Gospel DNA. But how could we summarise this more simply? Jesus assumed that to make disciples for him we must “go”. In fact his original word is “going” i.e. in all of life, (whether or not we travel elsewhere) we are to be constantly moving out of our comfort zone. Therefore, in all our Co-Mission churches we aspire to be pioneering in mission: urgent in prayer for the lost, innovative in accessing unbelievers, fearless in proclaiming the gospel of Christ, accepting unavoidable risk, working hard with sustainable sacrifice, willing to have a go and fail i.e. adventurous in trying to plant churches throughout London because we know that heaven is happy, hell is hot and eternity is a very long time. The first broad distinctive of our Gospel DNA is that Co-Mission plants and strengthens churches that resolve to be pioneering in mission. Jesus doesn’t just ask for converts making decisions, but disciples who follow Jesus through life – trusting and obeying all that he promises and commands in his Word. Therefore, in all our Co-Mission churches, we aspire to expound the Bible carefully, explaining the plain meaning of the text interpreted in its literary, biblical theological and doctrinal contexts, applying its truth with emotional intelligence to our lives today, exalting Christ in all the scriptures. We do this not merely for our education and enjoyment, but for repentant faith and equipment for works of ministry that our people and churches may be built up to maturity in Christ. We read the Bible this way not only in church on Sundays, but in our small group discussions, one-to-one mentoring, biblical counselling and in our private devotions. The second broad distinctive of our Gospel DNA is that Co-Mission plants and strengthens churches that resolve to be training with Scripture. Jesus was quite plain in requiring his disciples to reach people of all nations in every age (since he promises to be with them “to the end of the age” he is talking about all of us and not just his original disciples). This means we can’t leave cross-cultural mission to a few “missionary types” who like that sort of thing. The exciting thing for us in London is that the nations have come to London for education, business and in search of a better life. That’s why we particularly rejoice in immigration, despite the real social challenges that may come with it. And this is why we rejoice to live in a city where more than half of us were born outside this country. London is now the most cosmopolitan city in human history. We seek and take delight in the social and racial diversity within our churches and in our church-planting. We gladly contribute to various gospel-promoting denominations and fellowships and we celebrate our partnership in Christ with brothers and sisters around the world, especially those persecuted for Jesus. For we believe that the LORD of the earth who promised Abraham and his Servant King a kingdom of many peoples has commanded us to make disciples of all nations and has filled us with joy at the prospect of the multitude of peoples gathering before the throne to praise the lamb. The third broad distinctive of our Gospel DNA is that Co-Mission plants and strengthens churches that resolve to be diversifying in culture. The activity at the centre of Jesus’ Great Commission is to “make disciples”. Scholars confirm that this activity is not only plural in its outcome (making many disciples) but plural in its activity i.e. something we do together. There are many biblical reasons for working together as “inter-dependent” churches rather than just “independent” churches that don’t co-operate much e.g. we are not only called into congregations but into God’s people and family with mutual obligations of love. But one of them is right at the heart of Jesus’ Great Commission from which we take our name: making disciples is something Jesus tells us to do co-operatively. Good churches will provide prayer and financial support to churches and ministries far and wide (as our churches do in their giving for world mission). Good churches will also endeavour to work with other churches of their region (as our churches all participate fully in our regional “Gospel Partnerships”). But the churches of an “organic” network like Co-Mission, that is planting and establishing churches together, can co-operate even more generously and sacrificially. Our churches not only provide prayer and financial support and co-operation in regional mission activities, we share our in-service training for ministry trainees, pastors and evangelists, we share musicians, children’s teams and resources of every kind. What a joy it is to hear of one church offering crèche care for the parents of another Co-Mission church on its annual weekend away and for Hope Church Sutton to be planted with people from five Co-Mission churches. The fourth broad distinctive of our Gospel DNA is that Co-Mission plants and strengthens churches that resolve to be MAKING DISCIPLES together. We might call this “An exciting culture of collaboration”!